Dietary supplement containing vitamin B COMPLEX and inositol suitable for the children supplementation during the growth. 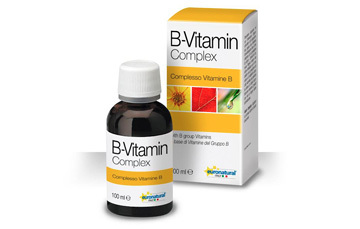 Vitamin B complex is involved in several biochemical processes regarding sugars, fats, and proteins, it is very important for the metabolism functions and it plays an essential role in the energetic pathway. Since vitamins are not synthesized by our body or they are synthesized in lower amounts, the intake with the diet is very important. The drink is suitable to prevent fatigue and exhaustion during the daily studies, the examinations stress and it is useful in improving memory and concentration. It has a pleasantly fruity flavour. The recommended dose is of 5 ml daily.